Offering you a complete choice of products which include wooden handicraft pooja plate, decorative marble pen stand, marble ganesh statue chowki, marble gold painting plate, marble mobile & pen holder and marble mobile stand. 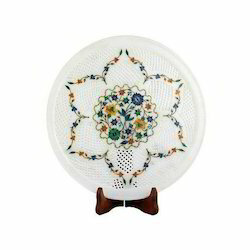 This is Indian Wooden Handicraft Pooja Plate, Made by our expert artisans. For making these Kundan Round Pooja Plate the raw material of Superior Quality has been used which is purchased by the trusted suppliers. 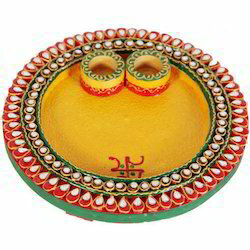 These Kundan Round Pooja Plate are useful for home decoration, worship, celebrating festival etc. 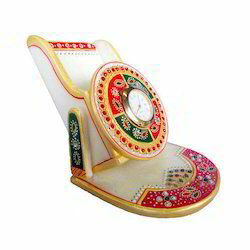 Being a quality conscious organization, we are engaged in offering the best quality Decorative Marble Pen Stand. We ensure to administer a series of quality tests on all these products in our internal quality testing unit. 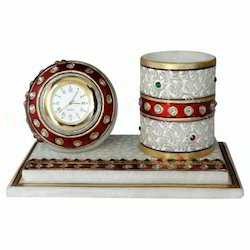 Further, these gift items are featured with unmatched designs, mesmerizing look and attractive colors. Thus, these are highly appreciated by our clients. 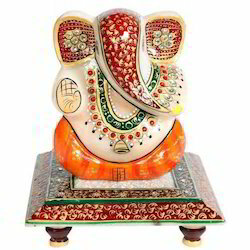 We are a known name in Marble Chowki Ganesh Statue and understand your need of perfect designs. We offer you Marble Chowki Ganesh Statue which are specially designed for you home and offices. These Decorative Marble Items are made up of purest forms of marbles which have been raised from authorized sellers of raw materials. Our craftsmen give a beautiful shapes to our items and make them in various designs and shapes. 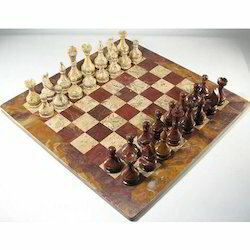 Our Decorative marble items get huge appreciations from all of our clients. Marble Gold Painting Plate are quite essentially beautiful and add a glimpse of royalty to any dull corner of the house. These dazzling white indian Marble Gold Painting Plate are made from fine marble which display stunning mythical artwork. 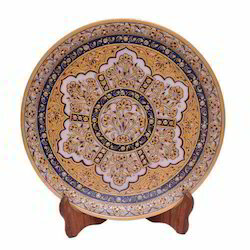 The number of styles, designs and sizes in which these Indian Marble Gold Painting Plate are available are virtually countless. 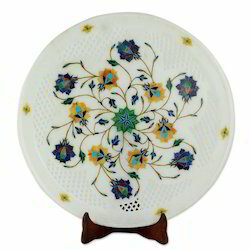 We produce decorative Marble Gold Painting Plate from original fine marble and sandstone. 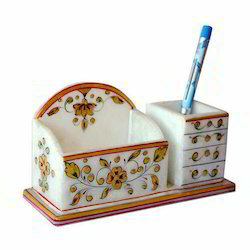 Our firm specializes in offering an innovative collection of Marble Mobile and Pen Holder. Each piece reflects the artistic qualities and time one has taken to shape these appreciative decors. Crafted in pure white marble, it is embellished with Meenakari and kundan work that is complemented by expert enamelwork. Exquisitely designed and intricately crafted, it makes for a perfect gifting option. Combine enchanting design with a host of utilities, you have this excellent Marble Mobile Stand. Alluring gold emboss work and Meenakari work without compromising on quality, purpose, utility and practicality. This is truly a unique piece to own and display! This gold embossed Mobile Holder with watch is a masterpiece. The gold foil work embossed on white marble carving is unrivalled piece of craftsmanship. 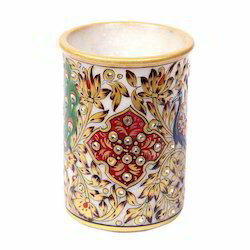 It is adorned with meenakari, gold work, and aditional colors. Being a marvelous work of art, it is a superb gift item for corporates. Customization Can be done inside the clock or over the box or at the back of the stand.